Investment in real estate never goes wrong if you really plan it meticulously and of course, why not to plan it perfectly? After all, it is a matter of investment so it is always better to see where you are investing and is it going to be lucrative or not? I know such questions create perplexity for you and then again you stay from the idea of investment, but this time you have to acknowledge all your doubts and get a profitable investment deal brimming with modern property for a world class experience and a secure investment serving high ROI. Now let us start with the hot residential properties which are definitely the best in 2019 to consider and each of them is planned in an exclusive way to meet the ultra luxury facilities. Here we are going to talk about the top 5 hot properties available in Gurugram and Delhi which is perfect in its own way because all the builders have used the best possible ideas to reach the new desires and give a home that never fails to stuns you. Let us start with the project and its benefits. Builder- Godrej Properties founded in 1990 and they are highly known for the true planning where they understand its customers very well because if they fail to deliver the new needs, then it won’t be possible for them to hold the possible in the market, but guess what? They have beautifully managed the position and the change that is required today. Project- This new residential property Godrej Platinum Okhla combines three different units 2 BHK, 3 BHK and 4 BHK apartments and each of them is well drafted to glean wide space, new designs, privacy, eco friendly ambience to add quality to your stay. Location- Planned in the centre of Delhi Okhla from where it connects to all the essential hubs to avail the opportunities, as you know Okhla is holding one of the biggest industrial areas that open up the job opportunities for the locals and most importantly, to get the day to days you requirements it sets every option for you. Builder- Adani Group founded in 1988 is one of the leading builders with great understanding to actually present matchless projects in different areas serving top notch lifestyle and a true investment deals to enjoy lucrative investments. Project- This project Adani Samsara Gurgaon forms a big township scattered over 75 acres of area where it adds two units 3 & 4 BHK Villas Floors and these villas are bigger in size and services, so that the experience is really amazing, if you want to get a big home with sway features, then this is better than all and to get a feel of big township this Adani Samsara sets a mark. Location- This project is situated in sector 60 Gurgaon which is the center of Gurgaon for an approachable distance to all the important hubs so that without driving too far you get everything. Builder- Shapoorji Pallonji founded in 1865 old and reputed builder in real estate market and they have been conceptualizing new age projects in different areas and of course, they assimilate the needs in the best possible way to bring a complete structure for a bigger stay. Project- This project Joyville Gurgaon combines the mixture of 2BHK Delight, 2 BHK Grande, 2BHK Luxury,3 BHK Grande and 3 BHK Luxury and every unit is projected nicely to get the capacious space with sun filled rooms, high privacy, appealing designs to spur the level of the project and more to create the best experience for the new generation. Apart from this, the builder has beautifully injected the new modern services like gym, spa, clubhouse, sports hub, gym, jogging track and party hall, so as per the mood you are free to pick anyone to excite your evening. Location- Joyville Gurgaon is planned in sector 102, Gurgaon, Dwarka Expressway it is one of the prime sectors in Gurugram from where it gives direct connectivity to many major hubs like Delhi border, IGI Airport, MNC’s, IT hub, commercial hub, business centre and then its wide roads, NH-8 and Dwarka Expressway curtails the distance and bring a smooth distance to all the destination. Builder- DLF LTD founded in the year 1946 and they have not just completed the years, but they have achieved the respect and trust and every time they develop projects with new vision and style. Needless to say, in Gurgaon, they are the highly preferred builder as every project they have delivered has changed the overall presence of Gurugram. Project- DLF Crest project brings the true combination of 2, 3 and 4 BHK Apartments and 4 & 5 BHK Penthouses and these ready to move property give you the freedom to come and experience the new class that has no comparison. With all modern facilities and high security system, it keeps its level up, so that you get direct access to all the perks. 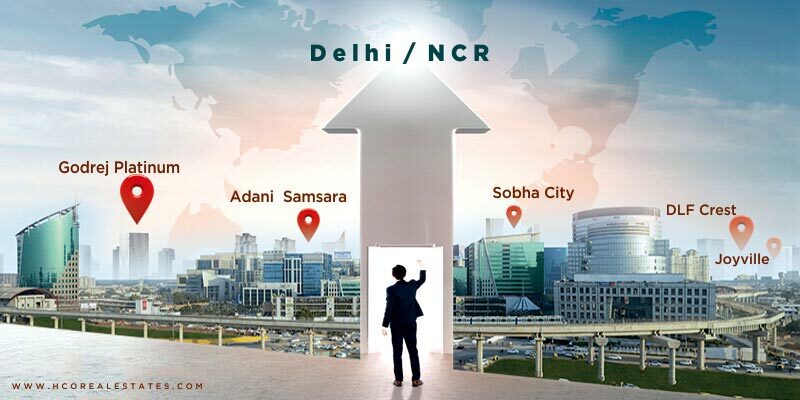 Location- Situated in one of the top sectors 54, Gurgaon from it connects to many ideal hubs DLF Cyber City, DLF Cyber hub, IT hub and many more hubs are in an approachable distance that not only improves your travelling, but it also offers high return over investment (ROI) in the upcoming time. Builder- Sobha LTD incepted in 1995 one more reputed builder who has already delivered many interesting projects in Gurgaon and in other cities and with its new features they always surprise its customers. Project- Sobha City Gurgaon is a well scattered project over the large where it captures grand apartments like 2 BHK and 3 BHK apartments and here the builder has managed only 2 units with no more configurations, so out of them you can pick anyone to explore the sun kissed rooms retaining its brightness, high privacy, its captivating designs to upgrade the level of the apartments and these are completely secured apartments. Its eco friendly ambience keeps the air fresh and energetic for all, so now when you will imbibe air you will always get a fresh air to hold its freshness, with this, its updated range of modern services like gym, spa, jogging track, clubhouse, party hall and even more creates it a big entertaining realm for you, now without leaving your destination you can get high range of options to pump up the overall experience. Location- This project is located in sector 108, Gurgaon which is close enough to Delhi border, IGI Airport, MNC’s and more. All in all, these mentioned projects are way better with brimming features to actually ameliorate the lifestyle of all new generations and most importantly, to let the investors and home buyers add a lucrative investment deal that serves profits in the upcoming time. So these 5 Properties in Delhi NCR have every new aspect to lead a better life as per the choice and need you can move to anyone to give your family a quality stay.